In order to search password-protected sections, you must open them first and conduct your search within ten minutes (you can change this setting on the Advanced tab of the OneNote Options dialog box). You can’t assign a password to a section with audio or video recordings. You can’t share password-protected sections with OneNote Web App. Passwords are case-sensitive (you must enter, and remember, the right combination of upper- and lowercase letters). 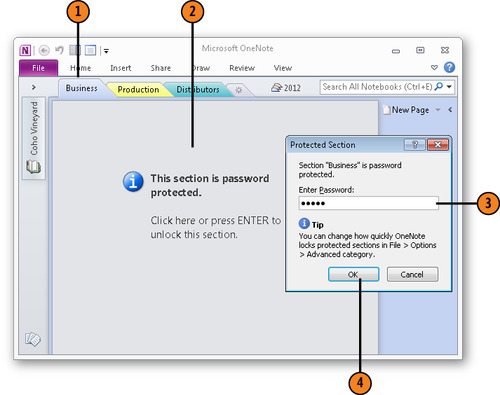 To password-protect a section, right-click its section tab and choose Password Protect This Section. Then, in the Password Protection task pane, click the Set Password button, enter the password twice in the Password Protection dialog box, and click OK. 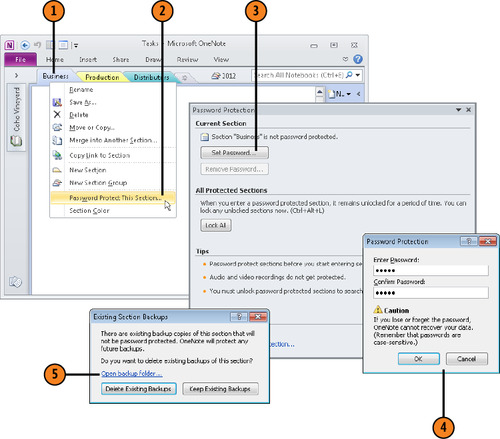 Remove a password in the Password Protection task pane by clicking the Remove Password button. To determine how long sections are unlocked and available for searching after you enter the password, click the File tab and choose Options. Then, in the Advanced category of the OneNote Options dialog box, choose a setting in the Lock Password Protected Sections After I Have Worked on Them menu. Right-click the section tab of the section you want to password-protect. Choose Password Protect This Section on the shortcut menu. In the Password Protection task pane, click the Set Password button. In the Password Protection dialog box, enter a password, enter it again for confirmation purposes, and click OK. If the Existing Section Backups dialog box appears, click Delete Existing Backups. Click on the screen or press Enter. Enter the password in the Protect Section dialog box. Choose Password Protect This Section. 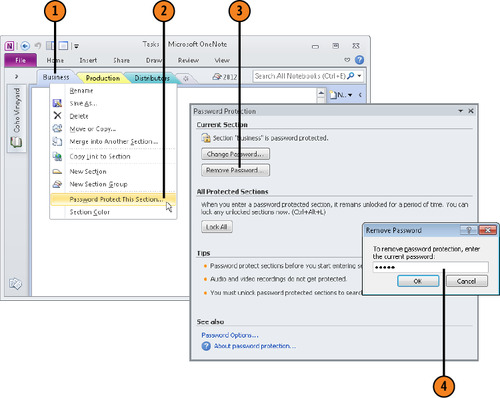 In the Password Protection task pane, click the Remove Password button. In the Remove Password dialog box, enter the password and click OK.
To change a password, click the Change Password button in the Password Protection task pane, enter the old password, enter the new password twice, and click OK.